Santa Claus came to town, and this time we didn’t frighten the children. Some time after Christmas I’ll share the story behind this photo. 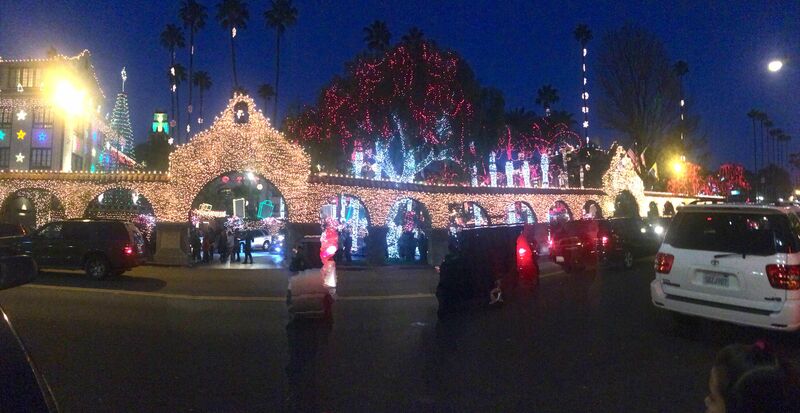 We enjoyed a family celebration–a pre-birthday gathering for Aimee, at the Mission Inn in Riverside and the annual Festival of Lights. This old hotel has several historical connections I’ll be eager to talk about. Tonight, my mind is busy. Forty years ago, in the wee hours of the 24th, I walked into the hospital ready to deliver my first child. Someone at an admitting desk took one look at me and said, “The manger’s at the end of the hall.” A couple of days later Aimee came home tucked into a Christmas stocking, the best Christmas gift I ever received. Tomorrow we’ll celebrate her birthday, but tonight we enjoyed our annual visit from Santa. It’s a delightful annual tradition. Our fire department has hosted this annual tradition since I was a child. We typically have advance notice of the night he will be traveling in our sector of the city, but on those nights all we know is to be ready somewhere between 6:30 and 9:30 pm. On clear nights the sounds of amplified ho-ho-ho accompanied by intermittent wailing from one or more of the accompanying emergency vehicles let’s you know Santa is on his appointed rounds, but the trick is figuring out when he is coming down OUR street. Many false runs into the cold night air typically indicate that the adults in the household are really just big kids themselves when it comes to Santa! One year, while eating our dinner, we almost missed the whole thing. Santa was a little earlier and all of a sudden we realized the sounds were mighty close! We abruptly grabbed the girls from the dinner table and ran outside. Gratefully, the sights and sounds of an exuberant candy-throwing Santa seemed to offset the trauma of being whisked from the table with little or no warning. But nothing compares with one year–the year we acted more like children than the children! Grab that poor wet baby and let’s get moving! With ludicrous antics mirroring TV’s Modern Family our behaviors took on a frantic display that should be reserved only for emergencies—or the Apocalypse! Sophia was quickly bundled and rushed outdoors, someone else grabbed Karina, and somehow we clumsily made it to the curb just in time to greet Santa. It wasn’t until we came back inside that we looked at one another in disbelief! What had come over us? Had we lost our minds? Well, yes, I think we sort of did just that. Since that time we make yearly plans to greet Santa as he comes down our street, but we try to hold our enthusiasm in check so as not to scare the children. Tonight’s Santa appearance was a success. The children were prepared and no one was traumatized. Only Zena was a bit confused. The noise from the accompanying Christmas light bejeweled police cars and fire engines was a bit confusing–she howled her enthusiasm. As I now say goodnight I also send my warmest wishes for Christmas and the remaining holiday season. Whether you celebrate in grand style or quietly withdraw into the stillness, it is my hope that however you observe this time of year you will be well and at peace. And please know that I count you as friends, thanking you for all that you have shared with me this year. I value each encounter. A little palate cleanser before we launch ahead! The simple solution is never to,have a bath again. I like your fire department – . Merry Christmas. Debra! We did thanks Debra – Ma Fightback bought me a new mobile phone so I can now figure out how it works! Now old friends replace the family as visitors and thenScotland for the New Year! So enchanting looking! Makes me wish we didn’t stay home to clean the nest today. Thanks for sparking the idea to do something seasonally different and fun! Happy Nesting. A very Merry Christmas Debra, to you and all you love and hold dear. I hope you’ve had a wonderful Christmas, Colleen. Now as we head into 2014 we can change our focus towards the future. I am looking forward to that, I think, but I’d like it to transition slowly…I’m a little tired. LOL! Have a great time with all your celebrations- we’re all looking forward to reading about them. Oh,I did enjoy this Debra. 🙂 Birthday greetings to your Christmas Eve baby and warmest Christmas wishes to you and Jay, my friend. I hope you had a truly lovely and meaningful Christmas, Perpetua. The “last” of our guests left this afternoon and I guess that means we close out our Christmas season. I can use a little quite before we launch into 2014! LOL! Cheers to the community tradition of Santa … simply fabulous … actually brought a tear to my eye. Happy Birthday to your daughter … Christmas greetings to you and your family … and I hope you get a chance to visit my post about Santa. http://afrankangle.wordpress.com/2013/12/23/on-virginia-and-santa-claus/ .. and of course I welcome your readers to come along! On Christmas Eve the handbell choir played at two services, which also means home-to-home took about 5 hours. Christmas Day was low key as we had my FIL over for chat, playing cards, and a simple dinner. At my end, you probably missed my Christmas Eve post of video gifts … and I’ve just started a series of short posts around Exploring … and I imagine you will enjoy these. See you when you get around to it. Thanks for the warm thoughts. Our Christmas spirit was definitely dampened, but not killed. Our fire department just did that over the weekend. We don’t have children here but somehow my husband got a candy cane. Hope you have a great holiday with your family. This is such a fun tradition. I love it. Happy Birthday to your daughter, and Merry, Merry Christmas to you and Jay. Christmas has some wonderful and fun memories for you! The Dickens quote is very sweet… Merry Christmas Debra! Merriest of Chistmast to you dear friend. Do you remember? Today is the one, the only Ruth Weber’s birthday! Happy birthday Mom! 🙂 She loved you so. Lisa and I will go out for a beautiful dinner tonight to celebrate her big light. Love you! Hugs to you and John! Great story, enjoy the festivities and see you on the other side! Me too. High winds up to 80 mph returned last night and are still going strong this morning. I am well battened down, safe and warm right now. Merry, happy, joyeux, feliz everything, Debra! See you after all the commotion settles down. and Merry Christmas to you All, and Zena and Darwin! What a great tradition! The firemen Santas, not grabbing a child from it’s bath and running headlong into the streets. Too funny, Debra! What we won’t do for the kids at Christmas. I hope you and your beautiful family are sharing a wonderful Christmas, Debra. That must have been quite a Christmas, Debra, spending it in hospital having a child. Hope you had a wonderful day with your family, Debra. Merry Christmas to you. Merry Christmas,Debra. Those lights are aplenty. Really cool! Hope your Christmas was Merry and Bright! And Happy Birthday to your Christmas Present! I hope you are doing well, too, Nancy! We had a lovely Christmas, but I am able to admit it is fine with me that it is over. LOL! It turns into an event even when we aim at simplicity! 🙂 Now on to the new year! Great stories but the hospital and the bath one. Hope you had a terrific Christmas. Finally catching up on blogs, Debra, and smiling with delight at your Christmas adventures, both new and not so new, with the momentous arrival of your Aimee forty years ago. December birthdays are always a challenge, none more so that on Christmas Eve or Day. I would love to hear more about this year’s birthday celebration. I hope your Christmas was joyous, filled, I’m sure with family and goodness. We’re a bit slower here this year, enjoying the holiday in special ways and moments. Oh Debra, I did enjoy this. I was once mad about all things Christmasy, these days I find contentment in peaceful stillness. Every year I would read, Twas The Night Before Christmas to Ken, and even at age 26 he sat with his arm around my shoulders and lovingly indulged his, Christmas mad, mother. This year I needed comfort so I retrieved the book from its special place, sat Big Ted on my lap and read the story aloud. I was was sad for a moment and then my heart filled with years of wonderful memories. Thank you for all the sharing of stories my dear friend, and thank you for never giving up on me when I sometimes absent myself. Better late than never Loved your story! I remember as a kid when my Dad went to the store to get soda while he was gone Santa came I just loved it. But when my Dad returned with no soda I finally figured it out! It was quite a wake up call hey you guys are not being honest to me! What was all that about! They said well we just though you enjoyed it so. Well yes but where is my real horse I have been asking for years Santa did not bring so why can’t you! since he isn’t real anyway! Well here I am 60 years old and still waiting for my horse! Ha Merry Christmas and now Happy new Year dear wonderful long time Friend! Much Love and Hugs!